It is exciting when I click on the Picnic Basket site in time to be on what ever their latest offerings are! 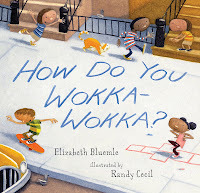 Recently I received Elizabeth Bluemle's How do you wokka-wokka? with illustrations by Randy Cecil. I did one quick read-through right after I opened the package and I have to admit I was not that excited. It begins like this: "Some days you wake up and you just gotta wokka-" and it continues through with adorable children asking how do you wokka-wokka. It was a bit too nonsensical for me but then I brought it home for story time and peaceful girl loved it!! She wokka-wokka'd all over her bed, her room and me with obvious delight!!! Maybe not great for bedtime but she loved it and kept wanting to go back to it when we moved on to her chapter book reading choice. With her as my guide I got it and it made me laugh. Looking through her joyful eyes at such fun, silly wordplay made the book come alive. I would highly recommend this choice for elementary students and I look forward to reading it to my 4 kindergarten classes just to see their own ideas of "how to wokka-wokka"!!! I'm sure my beautiful kinders will have lots of hip-shaking movements for wokka-wokka'ing!!! ***The author information at the back of the book says Elizabeth Bluemle owns The Flying Pig bookstore in Vermont, with lots of great information on their site. I dream of owning a little book shop myself!! !